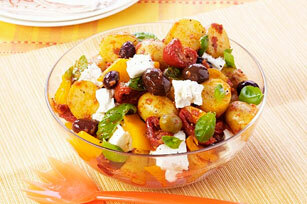 Aromatic olives and feta combined with a sun-dried tomato dressing make this extraordinary Mediterranean-style potato salad! Cook potatoes in boiling water in large saucepan 20 min. or until tender; drain. Cool. Place potatoes in large bowl. Add all remaining ingredients except dressing; mix lightly. Store potatoes away from direct sunlight. Prolonged exposure to light can cause potatoes to develop a green tinge, which tastes bitter and can be toxic if eaten in large quantities. Trim off any green areas before using potatoes.